Can Commitment to the 2030 Agenda Restore Human Rights? Honduras has committed itself to implementing the 2030 Agenda and its Sustainable Development Goals adopted by the UN General Assembly in September 2015. This commitment is essential to overcoming the pervasive violence that is destroying people’s lives. Women’s lives are particularly at risk, which means that achieving gender equality and empowering all women and girls by 2030, as mandated by SDG 5, will be a major challenge. Women’s rights are continuing to suffer major setbacks with the increasing concentration of power in the Presidency of the Republic. Implementing the SDGs, however, requires political will and as resources are increasingly allocated to re-militarization, it is clear that human rights are not the priority. Only if social organizations, with the support of the international community, encourage compliance may the situation of the Honduran people improve. Honduras: Can commitment to the 2030 Agenda restore Human Rights? Honduras has committed itself to implementing the 2030 Agenda and this commitment is essential to overcoming the pervasive violence in the country. Honduras has the highest level of economic inequality in Latin America and is listed as the most violent of all countries that are not in a war situation. Women's lives are particularly at risk, which means that achieving gender equality and empowering all women and girls by 2030, as mandated by SDG 5, will be a major challenge. More than 18,000 women and girls reported suffering sexual violence between 2010 and 2015, but in less than 6 percent of the cases have perpetrators been condemned. Implementing the SDGs requires political and the reallocation of resources currently devoted to re-militarization, it is clear that human rights are not the priority. Only if social organizations, with the support of the international community, encourage compliance may the situation of the Honduran people improve. 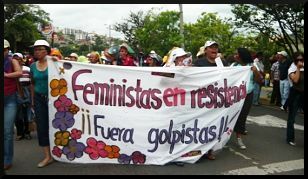 As the discussion about the national budget of Honduras are starting, women and feminist organizations assembled in different platforms and local networks, have started to demand participation in the debate. The situation of most Honduran women is precarious, they argue, having to face poverty and violence in their everyday life. Violence comes from their own family environment, from organized crime and from the repressive bodies of the State. 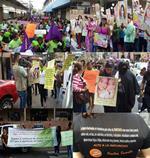 The Center for Women's Studies-Honduras (CEM-H), the Center for Women's Rights, the Women's Network of Colonia Ramón Amaya Amador, the Women's Network of Manzanal, the Women's Network of the Red Cross Col were present on February 22 before Congress in order to lobby and monitor that the proposal for a typification of femicide coordinated with the Ministry of Human Rights and Justice is in line with the work performed for more than ten years by feminist organizations for the construction of an offense that punishes men who kill women because they are women. The typification of femicide means to improve the registration systems of the judiciary, as well as to review and elaborate necessary, relevant and timely legislation for the recognition and punishment of other forms of violence against women. Since June 28, Honduras has been immersed in a deep political crisis, which was the day in which the Armed Forces – backed by right-wing political parties, the business sector, the Supreme Court, the Catholic Church, and the majority of the mass media – committed a coup d´etat against the elected President Manuel Zelaya. At the moment that the coup d´etat took place, President Zelaya had an approval rating of close to 60%.